WHAT IS THE ASSOCIATED TAXPAYERS OF IDAHO (ATI)? In 1946, a group of Idahoans formed an independent, nonpartisan, not-for-profit organization to work on behalf of Idaho’s taxpayers. Today, the Associated Taxpayers of Idaho remains the only statewide association encouraging effective and responsible government through research and public education. ATI’s broad based membership ranges from individual taxpayers to large corporations. ATI provides objective, historical and current tax and fiscal research from a taxpayer's perspective. 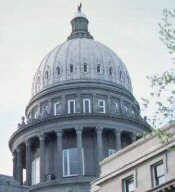 ATI’s credible information and taxpayer advocacy make it an extremely effective participant in the formation of Idaho's public finance policy. ATI represents its members at meetings of legislative tax committees, the State Tax Commission, the Governor's Office, city/county officials and other public entities. ATI also works closely with industry trade associations, chambers of commerce, a variety of civic groups, the media and many others. ATI is an active member of the National Taxpayers Conference (NTC), a national network of longtime taxpayers associations. It is also a member of the Government Research Association, a national professional association of individuals engaged in public finance research. ATI combines this national expertise with its own to maximize member services. By joining the Associated Taxpayers of Idaho, you will be partnering in an organization whose research efforts directly impact state laws, constitutional amendments, budgets and government programs in constructive, objective and practical ways that help you, your fellow citizens, your business and the communities you do business in. As a member, ATI provides you with a tremendous return on your investment. Click HERE for more details.